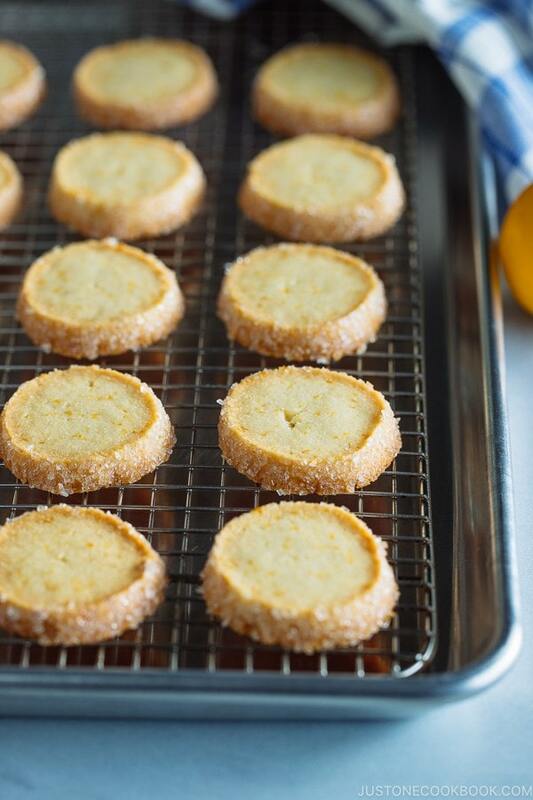 Buttery, citrusy and slightly sweet sable cookies, with a lovely hint of Meyer lemon zest. 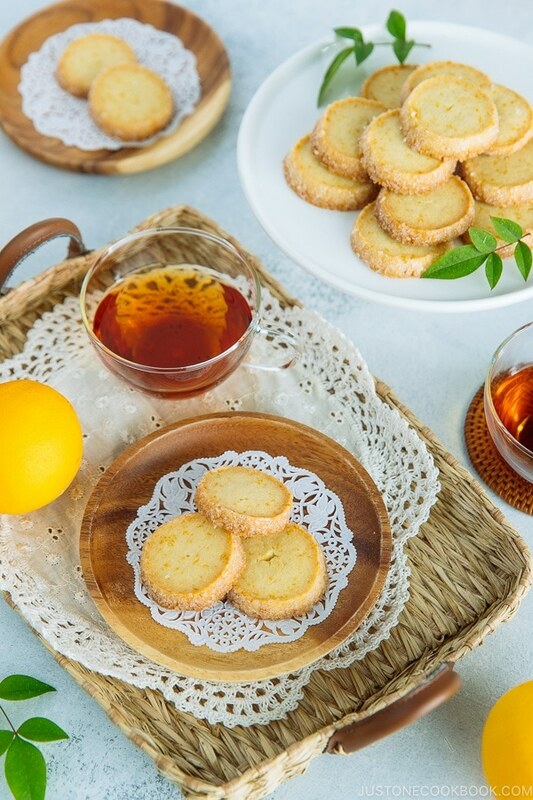 These crisp and crumbly Meyer Lemon Cookies are a perfect tea-time company! Although I don’t crave for sweets as much as when I was younger, when Meyer lemons are in season, I get excited to make Meyer lemon sweets. These deep golden winter citrus are such a special treat that it’s too hard to pass on. My family and I especially love Meyer Lemon Chiffon Cake which I make several times every season. 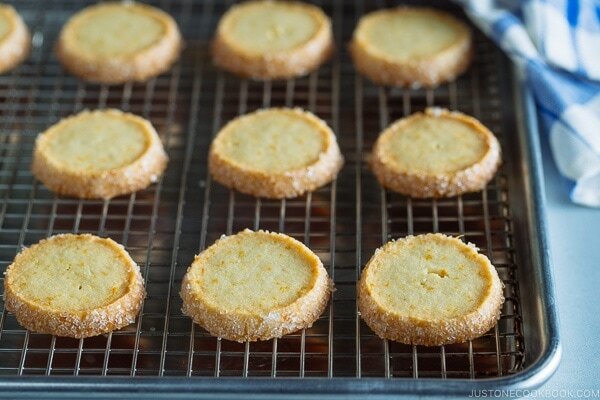 I also love these crispy, crumbly, buttery sables, Meyer Lemon Cookies (マイヤーレモンサブレ). Meyer lemons are smaller and rounder, and less acidic and sweeter than standard lemons. Their rind has a floral fragrance when zested. 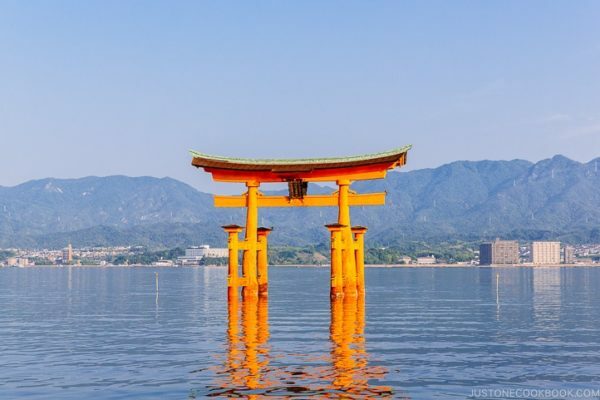 It’s known as a cross between lemon and mandarin oranges (also called tangerines). Do you have these lemons in your country? I had never seen or tasted this type of lemon while growing up in Japan. I recently learned that Meyer lemons were first introduced in the U.S. from China in the early 20th century. Isn’t it surprising to learn that the fruit originated from the East? It’s easy to make the assumption that they are of European origin when they bear a western name. As a matter of fact, the lemons actually get their name from Frank Meyer, who was a United States Department of Agriculture explorer who traveled to Asia to collect new plant species. These lemons are usually available from late November to May in California. My friend who brought these Meyer lemons for me said she had been harvesting a lot of fruits in her backyard this past January. What a lovely sight it must have been to see a blooming Meyer lemon tree in the backyard, especially in the depths of winter! Are These Cookies or Sablés? If you were wondering the question, I’m happy we’re on the same page. Yes, these are SABLES! A sablé is a classic French butter cookie originating from Normandy region. 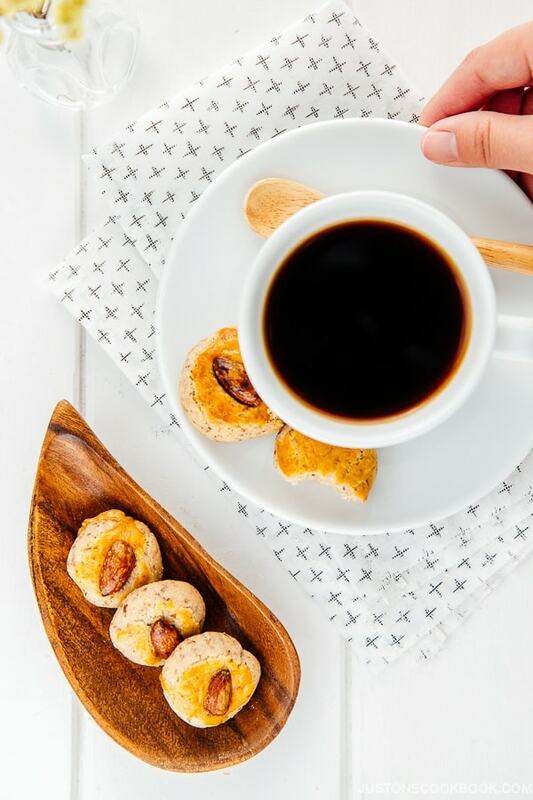 Sable in French translates to ‘sand’ as the texture of these cookies are crumbly and melt in your mouth. 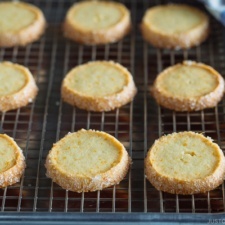 My original intention was to name this recipe Meyer Lemon Sablés, but the term is not commonly known in the U.S. So I named it simply Meyer Lemon Cookies, hoping that more people will search this term. 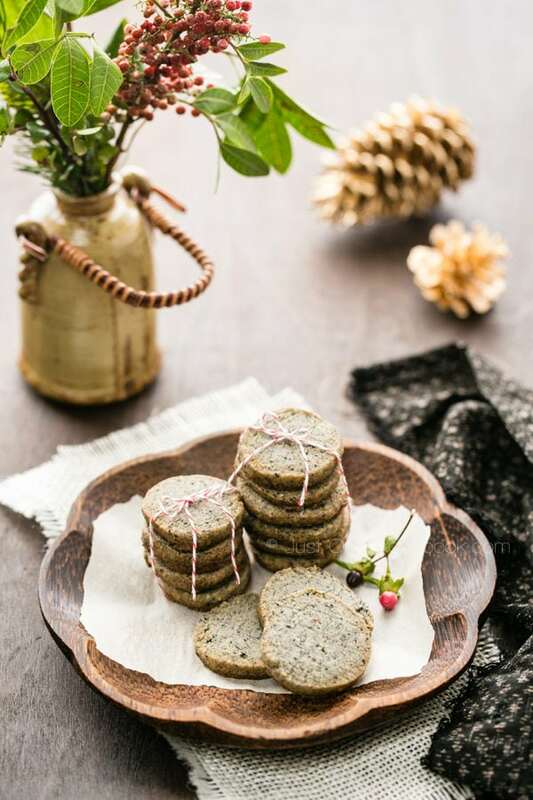 In Japan, sables are a much more popular type of cookies than American-style cookies probably due to the influence from the UK and European countries in our history. 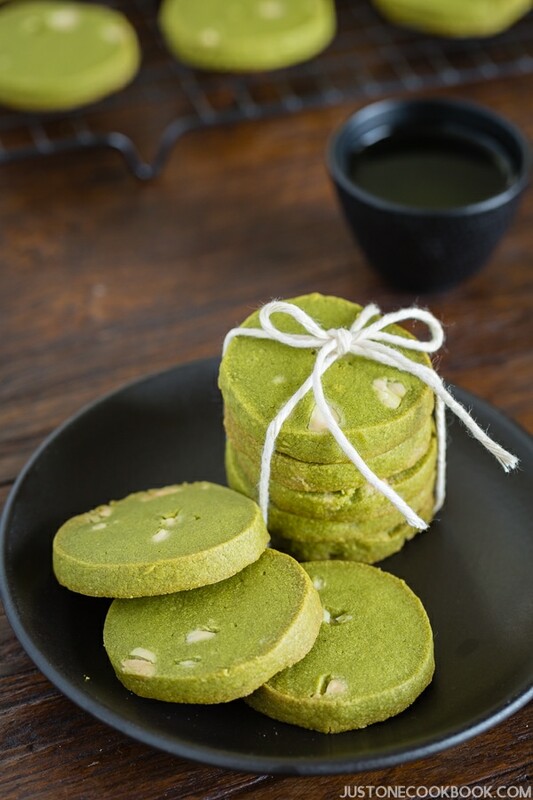 I grew up eating different kinds of sables, and I’ve shared some of my favorite sables using unique Japanese flavors such as cherry blossom, matcha, and black sesame flavors (Browse JOC cookie recipes). Meyer Lemon Zest: To replace the zest of 1 Meyer lemon, simply swap in the zest of 1/2 a tangerine and 1/2 a regular lemon. Cake Flour: I use King Arthur’s cake flour for convenience, but you can make cake flour by mixing all-purpose flour and cornstarch. For 1 cup cake flour, prepare 1 cup all-purpose flour, then take away 2 tablespoons of all-purpose flour and replace with 2 tablespoons of cornstarch. Be sure to sift the flour to distribute the cornstarch well before using it in your cake batter. 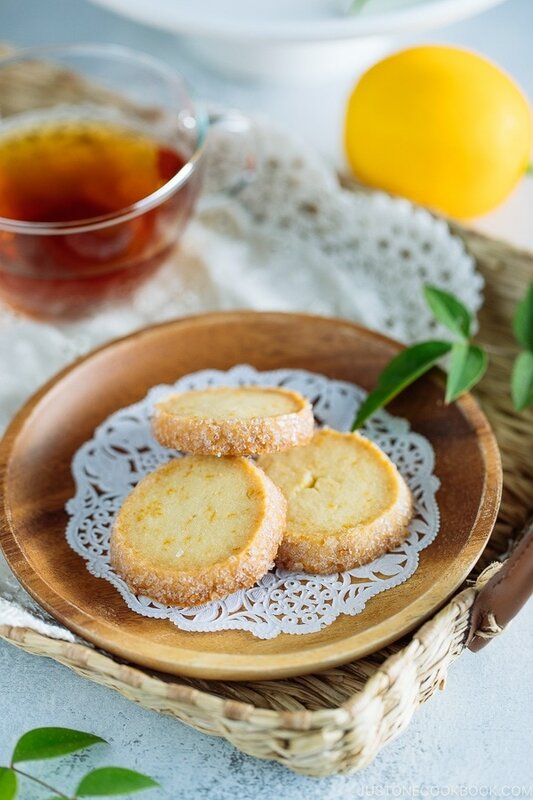 If you’re thinking to try out these darling citrus for the first time, grab them from your winter markets or grocery stores while they are still in season and make these Meyer lemon cookies! 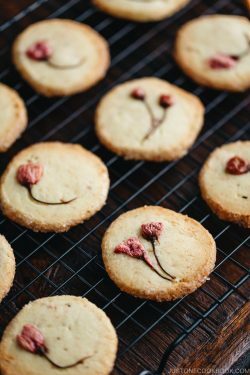 The buttery cookies make a bright company for Lunar New Year, Valentine’s Day, tea break or someone you know who is in need of a little cheer to get over the winter blues. Cut the unsalted butter into smaller pieces (so that they will soften faster). It’s important to soften (not melt) the butter before we start. In a stand mixer fitted with the paddle attachment or in a large bowl with a hand mixer, beat the butter until smooth and creamy. Add the powder sugar and blend until soft and light. Scrape down the bowl as needed. Sift the cake flour and almond meal into the bowl. Add zest from 3 Meyer lemons. Make sure you just zest the yellow skin, not pith (white bitter part). Add the milk and mix all together with the silicone spatula. At the beginning, the dough is crumbly, but it will come together into a ball. Because the dough will be still too soft to roll into a log shape, take out the dough from the bowl and wrap with plastic wrap. Keep in the refrigerator for 1 hour. Take out the dough from the refrigerator and unwrap. Shape the dough into a cylinder, about 1.5 inches (4 cm) diameter. Wrap in plastic wrap and chill in refrigerator until firm, at least 2 hours. Optional: you can place the dough on a bed of rice while chilling. It helps the dough in nice cylindrical shape, so your cookie slices won’t be flat on one side. Preheat the oven to 375 ºF (190 ºC) degrees. Line the baking sheet with parchment paper or silicone baking liner. Take out the cookie log (dough) from the refrigerator and remove the plastic wrap. In a tray that fits the cookie dough, sprinkle the white sparkling sugar. Roll the cookie log on the sparkling sugar until the log is covered with sugar. The sugar should stick without any issue, but you could wrap the dough with a damp paper towel so that the dough will be slightly wet or brush egg wash on the dough (traditional method). With a sharp knife, slice the dough into 1/3 inches (7 mm)-thick rounds. Place them on the baking sheet, leaving about 1” (2.5 cm) between rounds. Lower the oven temperature to 350 ºF (180 ºC) and bake the cookies for about 25 minutes, or until the edge of the cookies start to get golden brown. Remove from the oven and let cool on the baking sheet for 5 minutes; then carefully transfer to a cooling rack and let cool completely. If you pack the cookies in an airtight container, they will keep for at least 4 days. You can also freeze the unbaked log of dough, wrapped in plastic wrap, for up to 2 months. Let sit at room temperature for about 10 minutes before cutting and baking. Do not let the dough fully defrost. Cake Flour: A properly measured cup of cake flour weighs 4.25 oz (120 g). The weight for 1 cup flour varies on how you measure it. When you measure flour by volume, please follow the methods below. I’ve tested this method many times, and if you do it properly, 1 cup is VERY close to 120 g each time. Using the spoon, sprinkle the flour into your dry measuring cup (the one that measures exactly a cup at the top). White Sparkling Sugar: It can be replaced with granulated sugar. Sparking sugar has large grain so that it won't melt and disappear. It gives nice look as well as nice crunch when you bite to it. Such pretty cookies and perfectly round. These sound so wonderful! I can’t wait to try them. Thank You, Nami! These look perfect for the warm weather we have in Australia right now – just need to track down some Meyer lemons! 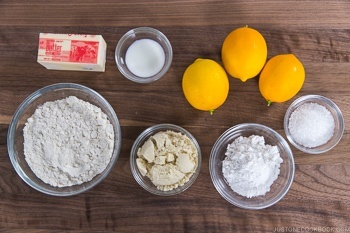 ,but i have lemon extract,can i use it for your meyer lemon cookies recipe? Thank you so much,I will make those cookies when i have time. which gave them a browner look due to the almond skins, so next time I’ll use almond flour so the yellow of the Meyer lemon stands out more. I had no idea the Meyer lemon was from China! Thanks again. I tasted the dough before it went into the fridge and it tastes kind of bland to me. I notice there is no salt in the recipe. Is this deliberate? I’ve never made pastry without salt! Thank you for sharing many delisious sldessert recipe to us!!! I love all desserts from Japan and Taiwan. They are Sweet but not that sweet like America! I notice that you used almond flour in the recipe . May I just just the cake flour instead the almond flour since my kids are allergic to almond? Will the texture changed? 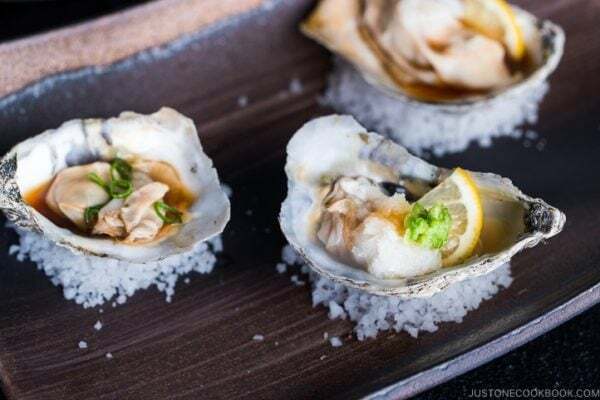 Hi Nami, I’m staying in LA but i cant seem to find Meyer Lemon. May I know which mart you go to?